What do you do when you need to read only the highlighted text in a document? Just scroll down and read the highlighted text. Yes – that works. But you have to keep scrolling to find the next highlight. It may be one page away or 24 pages away… not very efficient! Here is the right way. Make sure you have a document which contains many areas highlighted. Press to go to the beginning of the document. Click Find next button. Now first highlight will be found. to go to previous one. By the way, this shortcut works for anything you have just FOUND using the Find dialog. 15 year old feature. Did you know it? Did you need it? 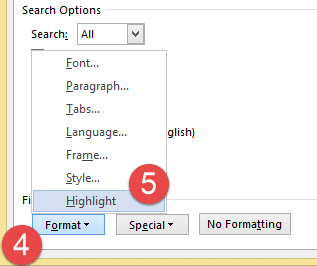 Previous PostHow to create complex Word tables in secondsNext PostIs there a keyboard shortcut for word count?